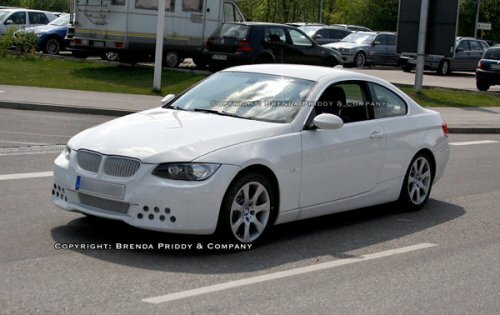 The next-generation BMW 3 Series isn't that far off, with the sedan expected to debut sometime in 2011 as a 2012 model. Yet the Munich brand isn't sitting on its hands in the meantime – the current 3 Series coupe and convertible are getting a mild refresh and updated powerplants this spring for the 2011 model year. The most immediately noticeable change are headlamp clusters that get a subtle reshaping to go along with a wider grille and reworked lower front fascia. At the rear, the taillamps retain the same shape, but the reflectors are redesigned with some of the light-pipe styling found in other recent Bimmers. The 3 Series coupe will now be offered with xDrive all-wheel drive, while the 3 Series convertible gets a new solar reflective leather upholstery that BMW claims helps keep seat temperatures down when the lid is open. The most significant updates come underhood, where the much lauded twin-turbocharged 3.0-liter inline-six is being replaced by a new single turbo version. The revised engine, dubbed N55, has recently been launched in the 740i and the 535i Gran Turismo. The twin scroll turbo has dual exhaust inlets that allow the engineers to better balance the pulses coming in to spin up the turbine faster. This is expected to reduce the turbo lag that some drivers complained about with the outgoing twin turbo setup. BMW also claims it has reduced cold-start emissions by routing all the exhaust gases through a single, larger catalytic converter that heats up faster. On the intake side, the throttle is eliminated thanks to the addition of BMW's Valvetronic variable valve control system. The N55 also gets direct fuel injection. The end result is the same 300 horsepower and 300 pound-feet of torque as before, but with a fatter torque curve that maintains its peak from 1,200-5,000 rpm. 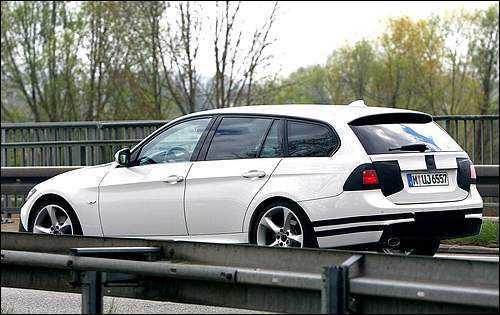 he 2010 BMW 3-Series is largely unchanged. These premium-compact cars come as 2-door coupes and convertibles, as well as 4-door sedans and wagons. Convertibles have a power-retractable hard top. The 3-Series model lineup consists of the following: entry-level 328, top-line 335, and high-performance M3. Depending on body style, the 328i comes with rear-wheel drive or with BMW's xDrive all-wheel drive. It's powered by a 230-horsepower 3.0-liter inline 6-cylinder engine. Also depending on body style, the 335i is available with rear-wheel drive or AWD. Those models are powered by a turbocharged 300-horsepower 3.0-liter inline 6-cylinder. The rear-drive 335d has a 265-horsepower 3.0-liter turbodiesel inline 6-cylinder that is emissions legal in all 50 states. M3 models use a 414-horsepower 4.0-liter V8. All BMW 3-Series gasoline engines team with a 6-speed manual transmission. Optional on the 328i and 335i and standard on the 335d is a 6-speed automatic. The M3 is available with a 7-speed dual-clutch automated manual that behaves much like an automatic. Available safety features include ABS, traction control, antiskid system, and front-side airbags. Head-protecting tubular side airbags are standard on all but convertibles. Convertibles have rollover bars designed to deploy from the rear headrests if sensors detect an impending tip. Cars with the optional navigation system get BMW's iDrive that uses a console knob to control entertainment, navigation, communication, and other functions. Available features include steering-linked xenon headlights, BMW's Active Steering that quickens steering response at low speeds, rear-obstacle detection, adaptive cruise control, and BMW Assist service with a wireless cell-phone link. As the launch date of the new F30 3 Series draws closer, more info will start to appear online and in magazines. It won’t be too awfully long before we start reading first driving impressions and start hearing the moan of fanboix the world over picking apart one aspect or another of the new 3er to complain about. What BMWBLOG expects the new F30 2012 BMW 3 Series to be is based on what we can discern from press releases, our understanding of BMW’s ‘platform matrix’, and the continuing march forward of EfficientDynamics. As we previously wrote, the latest X3 is a good place to look for insights into the new 3er. The 3 Series is BMW’s cash cow, subsequently don’t look for exaggerated styling since the 3er has to appeal to an extremely broad market in North America, unlike the 1er, for example. Expect the looks of the car to reflect the styling idioms incorporated in the 7er and 5er. The wheelbase will be stretched a bit, possibly three or so inches, while the overall length of the vehicle should remain under 180 inches. The styling should be crisp, with a minimum of superfluous lines but with subtle detail that is revealed in light and shadow. The suspension will be the tried and true double-joint spring-strut (MacPherson strut) up front with the multi-link setup in the rear. It works well so there’s no big reason to fiddle with it. Engine options should be the new turbo four cylinder in the 328i and the N55 turbo six in the 335i. Expect the next generation M3 to get a turbo six cylinder also. There’s some hope that the Dynamic Handling Package will be available as an option. The automatic transmission should be the ZF eight speed (8HP). A manual transmission almost certainly will be available for the 335i at least, if not the 328i. What will interesting is will BMW avail themselves of two other options that the 8HP provides, an eight speed dual clutch gearbox and a hybrid drivetrain (an electric motor nose on the transmission and additional batteries). If a hybrid is done – and we expect it will be, it should be on the 328i and stop/start technology would be included with it. On the subject of EfficientDynamics we should expect that weight should be less than or no more than the current 3er. In addition, and here’s where the wailing starts, the 3er will be equipped with electrically assisted power steering. It provides sufficient fuel economy savings to warrant it’s inclusion. Elements of BMW’s ConnectedDrive should be available as should active cruise control and other electronic safety features that use of the FlexRay bus enables. The development costs of these features needs to be spread across as wide a range of vehicles as possible and the new 3er will benefit from them. 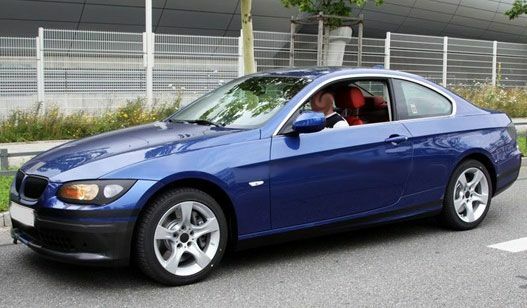 The new 2012 BMW 3 Series will be an evolution of the existing 3. It will appeal to a large number of potential buyers looking for a sporting premium sedan. It will have the power and handling we expect from a BMW, coupled with luxury accommodations and an expansive – or should that read expensive – list of options.